When the experienced meet the wealthy, experience and wealth are exchanged. An explanation of guitar amplifier design, and why they are so different to standard amplifiers. There's information on valve and transistor designs, history on overdrive (or distortion) trends, and some overdrive circuit diagrams for experimenters. Sound and technical descriptions of common guitar effects, with recommendations for which order to use them. An explanation on how different guitar pickups work, useful wiring tips with circuit diagrams, pitfalls to avoid, and a description of the harmonic vibrations of guitar strings! Some odds and ends, including interesting and frequently asked questions (FAQ), with my thoughts on top solos, players and guitars. Also an index to schematics on my site. Guitar Design - a good book! Other than guitar pickups and wiring, I don't claim to be expert in details of how to design a great guitar. For this, I strongly recommend a book by Leonardo Lospennato called Electric Guitar & Bass Design. It explains clearly and accurately each aspect of electric guitar design with their different options and impacts on the finished product. It might be surprising to non-guitarists that just about every item in the guitar signal chain is designed and intended to modify the signal in some desirable way. Let's look at each part of the chain and how it modifies the natural guitar sound. 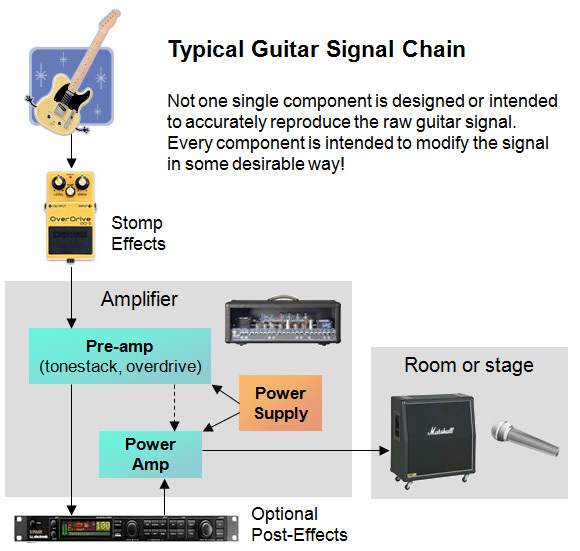 Here's a diagram of a typical guitar signal chain with an explanation for each item. Your tone starts with the guitar. With so many different guitar types available, it's not surprising there are so many different guitar tones. Construction: Hollow or solid body, bolted or set neck. There's no right or wrong design, although it could be argued that the heavy body/set neck Les Paul design offers the best sustain for natural string decay. On the other hand, bright woods are used on the Les Paul to compensate for dark pickups, so the electric sound is not much like the acoustic sound. 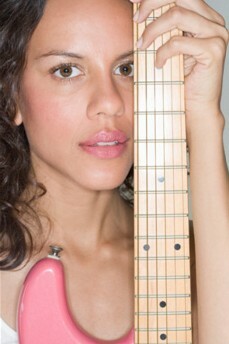 Wood: Different body and neck types affect tone. Many popular guitars such as the Fender Stratocaster and Telecaster are available with different body and neck woods for different tones. Even the body and necks are often capped with different types of wood for appearance and tone changes. Pickups: Single coils read a narrow portion of string vibration; humbuckers read more of the string length. Additional coil windings, different pickup constructions and switching options have a significant impact on tone and timbre. Strings: Of course, the vibrating string IS the raw sound, so having clean strings is vital to good tone. Most players prefer relatively new strings that have a brighter and richer tone. The strings need to vibrate freely, so the guitar needs to be setup properly. Surely the guitar cable should connect the guitar without modifying tone? Actually, no. All cables have a small amount of capacitance which rolls off some extreme highs. These tones are sometimes referred to as "ice-pick" tones and can be quite objectionable, particularly with single coil pickups. The same effect cannot be achieved with a lower treble setting, because those controls operate at a lower frequency. Some guitarists use a radio system instead of a guitar cable for more performing freedom. It's interesting that the best digital radio systems are now capable of very accurate reproduction and often include settings to simulate treble loss from a real cable. Interfacing: The preamplifier receives a low voltage, high impedance signal from the guitar and converts it into a high voltage, medium impedance signal for the power amplifier. It may also provide send and return interfaces for an external effects loop. It needs to do this with proper gain-staging to minimise noise and maximise dynamic range. Tone Controls: The tone stack is by far the most common type of guitar tone control. It intentionally cuts low middle response to compensate for the low-middle emphasis in typical guitar pickups. This is where your amplifier's bass, middle and treble controls are connected. One exception to the tone stack applies to jazz guitar styles: these players generally prefer a strong low-middle emphasis, so jazz guitar amps often use standard "hi-fi style" tone controls that don't compensate for this bias in guitar pickups. There's more on tonestacks on my amp basics page. Overdrive: All modern preamps have enough gain to push the power amp strongly into overdrive. So even though they might not be overdriving internally, they can deliver a very strong signal to the power amp. Many amps offer pre-amp overdrives where the preamp itself is overdriven. The overdrive can be designed to occur before or after the tone controls, which makes a huge difference to the overdrive character. Overdrive before the tone controls is really the same as an outboard overdrive stomp box. A few sophisticated amps include multiple overdrive stages, some before and some after the tone controls. Modulation effects such as chorus, flanging, leslie & tremolo. Ambience effects such as delay and reverb. These effects are designed to re-create desirable playing environments, or exaggerate them for effect. This is the critical component in the chain for generating the "feel" that enables different electric guitar playing styles and music genres. There are many design choices in power amps that make significant differences to overdrive character and dynamic response. Two contrasting designs are Fender Twins that hold their clean power to near maximum power, then move into a compressed but still relatively clean zone. On the other hand, a typical Marshall design starts to break up gently well before maximum power, giving a really wide "sweet spot". There's more than just choices of valve types, class of operation (class A, or AB usually) and power ratings: one of the key design decisions is if or how negative feedback is used. Class A designs are often used without negative feedback, giving them a somewhat "loose" and tonally rich tone. Class AB designs need at least a small amount of negative feedback, which gives them a tighter and punchier tone. Presence controls are common on amps with negative feedback. Presence reduces negative feedback at treble frequencies, which boosts overall treble as well as giving the treble some of the "no feedback" characteristics. Some amps include a resonance control that does the opposite: boosts bass by reducing bass in the negative feedback, which also gives a "looser" feel to low notes. Yes, even the power supply is intended to modify guitar sound! It needs to be limited so that the overdriven power amplifier cannot deliver excessive power that could damage components in the power amplifier and the attached speakers. The way the power supply responds to excessive power requirements affects the "feel" of the amplifier. The key variations are how much the power supply drops when excessive power is required, how long it takes to drop, and how long it takes to recover. Amplifiers with noticeable power supply effects are described as having "sag" or "bloom". One side-effect of a power supply sagging is that regulation also decreases, which can inject hum into the overdriven signal. The hum can interact with notes being played, causing additional inter-modulation notes, often called "ghost" notes. Most players find like this side-effect undesirable, but some purists will say it's an integral part of the amplifier's tone. Usually frequency response tapers off very quickly above the 4Khz to 8KHz range. Typically a gradual tapering off below about 100Hz. Some metal styles prefer an enhanced bass response, but this needs to be managed carefully in a live situation to get a good mix with bass guitars. Soft clipping characteristics, mainly to limit excessive cone excursion, but also to add some additional overdrive flavour. The combination of cabinet reflections and multiple speaker sources produces a frequency response with significant peaks and troughs, particularly above about 1KHz. This is critical to the signature sound of many desirable and historically famous guitar tones. One generally undesirable characteristic of guitar speakers is that their high frequency response is much stronger directly in front of the speaker compared to off-axis. If possible, it's preferable to not face guitar speakers directly at performers or audiences. The playing environment affects the final sound with reverberation effects as well as some frequency resonances. Just like orchestras have favourite concert halls, guitarists have favoured environments to get their best "room tone". Even in an ideal room, the sound is often captured with a microphone for recording, or live reproduction. It should be no surprise that microphones have their own signature sounds that can enhance (or destroy) good guitar tone. Popular choices include the Shure SM57, Royer R121, Sennheiser 421 and Neumann U87. As you can see, every item in the guitar signal chain plays a role in modifying the guitar signal to produce something desirable at the end. If you plug a guitar directly into a recording desk or hi-fi for comparison (keep the volume down! ), you can hear how radically different your favourite tones are! As a guitarist, you have a wide range of products to choose from with each of these items. With some trial and error, you're likely to gravitate towards the gear that you like best. Skilful use of your gear combined with the playing style you develop is what makes you a unique player.